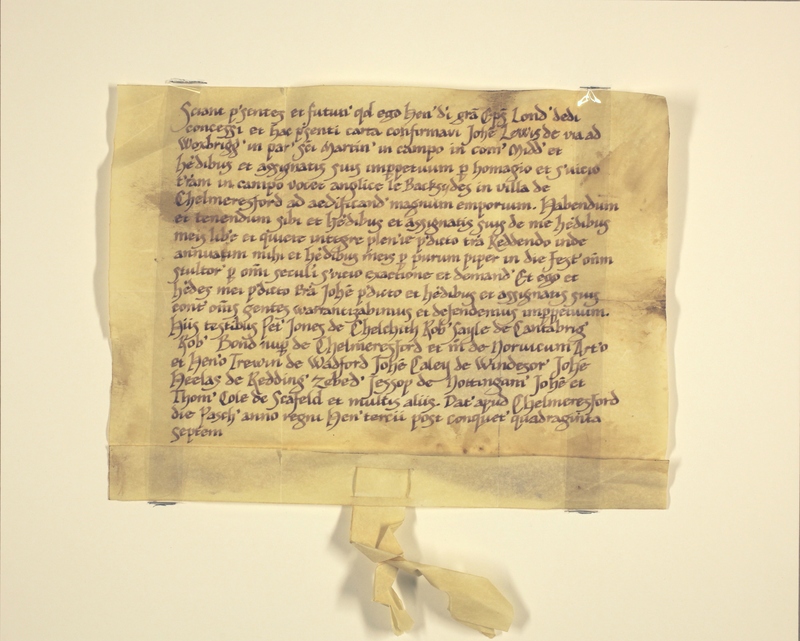 A deed dating from 1263 was recently discovered by our archivists in the county archive which shows that Henry of Sandwich, the Bishop of London, granted land to John Lewis (recorded as ‘Johannes Lewis’ in the medieval Latin) of the Uxbridge Road in Middlesex to build ‘a big shop’ in Chelmsford town centre. This story has particular relevance for 1 April, as in return for the land John Lewis was to pay Henry of Sandwich ‘one chilli pepper on the feast of All Fools’ each year. 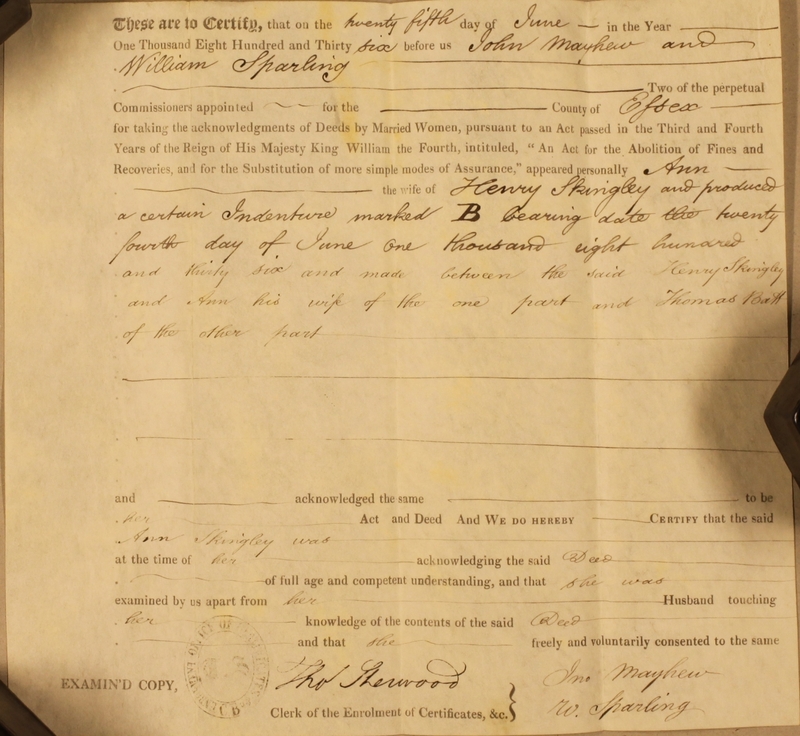 The deed names several other men as witnesses, Peter Jones of Chelsea, Robert Sayle of Cambridge, Robert Bond recently of Chelmsford and then of Norwich, Arthur and Henry Trewin of Watford, John Caley of Windsor, John Heelas of Reading, Zebedee Jessop of Nottingham, and John and Thomas Cole of Sheffield. The deed ties in with a later map of Chelmsford dating to 1591, which helps us to identify the land in question. 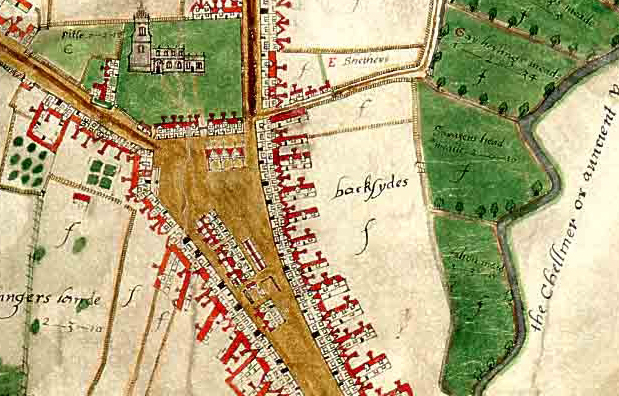 Lewis was granted ‘land in the field called in English Le Backsydes’, which is clearly shown on the later map to the east of the High Street. The map also shows us how little the shape of Chelmsford has changed since the medieval period. In an interesting coincidence, the 750 year old document reflects the 75th anniversary of the foundation of the Essex Record Office. Let all men present and future know that I Henry [of Sandwich], by the grace of God, Bishop of London have given, conceded and by this present charter have confirmed to John Lewis of the Uxbridge road in the parish of St. Martin in the Fields in the county of Middlesex and his heirs and assigns for ever for homage and service, land in the field called in English Le Backsydes in the town of Chelmsford to build a big shop. To have and to hold to him and his heirs and assigns from me and my heirs quietly freely and fully the said land paying annually to me and my heirs one chili pepper on the feast of All Fools for all secular service, exactions and demands and I and my heirs will warrant and defend the said land to the said John and his heirs and assigns against all people forever. These being witnesses Peter Jones of Chelsea, Robert Sayle of Cambridge, Robert Bond recently of Chelmsford and now of Norwich, Arthur and Henry Trewin of Watford, John Caley of Windsor, John Heelas of Reading, Zebedee Jessop of Nottingham, John and Thomas Cole of Sheffield and many others. Given at Chelmsford on Easter Day in the forty-seventh year of the reign of Henry III.